If your abode suffers from lack of natural light, there are a few solutions that can make it feel bright and welcoming. Here are some tips to help you lighten up. Living the rental life has its benefits: the flexibility to move whenever your lease is up, access to neighborhoods you might not be able to afford to buy into (yet), and someone to fix anything that breaks. However, unless you're living in a superluxury building, chances are good that at least one room in your place lacks that gorgeous natural sunlight that's the difference between a "charmingly cozy apartment" and a cave. But whether you're moving into a new apartment for rent in New York, NY, or a bungalow in Atlanta, GA, an odd layout, a less-than-ideal wall color, a brick wall view, or even a lack of windows can make your new home feel dark and dreary. 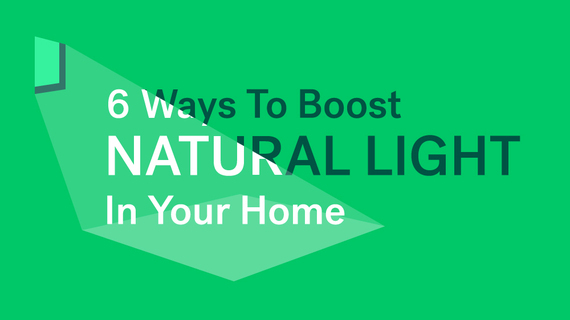 If your abode suffers from lack of natural light, there are a few solutions that can make it feel bright and welcoming. Here are some tips to help you lighten up. Light colors are the hands-down favorite decor trick for creating an open and airy setting. White, of course, is the easiest choice. But some shades can look flat or dingy, depending on the undertones. "One of our favorite colors is Benjamin Moore's Moonlight White. It has just enough depth to make an impact while still reading as very bright," says Gale Sitomer of G Sitomer Designs. We know what you're thinking: Some landlords panic at the mere mention of paint. However, if you're currently stuck with dark walls, Sitomer recommends opening up the conversation with your landlord -- especially if you plan on staying awhile. Be sure to stress that you'll be painting the apartment a neutral color. (Hint: Have samples of the new shade to share!) If they won't budge, cover those dark indigo walls with temporary wallpaper in a light hue. And if that's still a stretch, Sitomer suggests working in furniture or accessories in a light color. Objects in a mirror can definitely look larger than they really are. This especially holds true in a room, according to Amy Fleischman of Drapes Decor. The key is mirror size and placement. "The bigger the better for mirrors to make a space look large -- and they should also be simple, clean-cut, and placed in a space to reflect surrounding furniture," she says. Best of all? Reflect a window. "We recently worked on an apartment on the water that made use of a large mirror on the wall to reflect the view and create the illusion that the water continued on," adds Fleischman. No, clear furniture doesn't have to look like the '80s. Glass, Lucite, and acrylic designs have made a huge comeback -- and they can do wonders to maximize a feeling of spaciousness in a room. "The ability to see through the furniture allows one to see the rest of the space, which makes everything look less cluttered," Fleischman says. Clear coffee tables, side tables, and even lamp bases can make a huge impact. Pro buying tip: If you can't choose between glass, Lucite, and acrylic, she recommends going with acrylic: It's thicker and stronger than glass yet (generally) more affordable than Lucite. Light-blocking curtains can help you get a good night's sleep, but if they're your only window dressing, you'll be left in the dark during the day. For this reason, Fleischman recommends a layered, two-treatment approach that gives you options depending on your needs. "Closest to the window, you can use a blackout roller shade or blackout-lined drape to block out the light at night. In front, the use of a solar shade that is minimum 10% -- preferably 14% -- opaque will allow light in while keeping UV rays out," she says, adding that the layered approach isn't the only solution; she opted for light-filtering sheer shades in the dining area pictured above. "You can also do this using a fabric that has an open weave, therefore letting light in." While it might not be as glamorous as a chic acrylic table, keeping all surfaces clear of dirt and grime is a cheap shortcut on how to brighten a dark room. Both Fleischman and Robberts agree that giving your windows a thorough cleaning will instantly brighten a room. But there's a commonly overlooked item that affords an even bigger benefit when cleaned: light bulbs. That's because accumulated dust and dirt can dramatically reduce illumination of a bulb (by up to 50% when factoring in the age of a bulb, according to Consumer Reports). While you're at it, give those walls a good cleaning -- dirt and dust also reduce the amount of light they'll reflect, making a space feel dark and (rightfully) dingy. If you'd prefer a single-product solution, designer Julia Robberts has a simple recommendation. "Blinds can also be a good option -- even when they are blackout-lined -- if they're hung above the windows, so when they're in the raised position they sit above the glazed area." This way, you can use the full window during the day, maximizing light. "Having good storage that keeps clutter at bay can help a space feel bigger -- less is more!" says Robberts. Sure, you can't turn a studio into a penthouse, but limiting clutter reduces visual chaos. Just think twice about investing in clunky storage furniture, like big armoires and shelving units, and choose scale-appropriate furnishings. Ottomans and benches with hidden compartments, along with under-the-bed and under-sofa bins, keep everything out of sight without wasting a square inch. Have you brightened up a dark space? Share your tips in the comments!